Snowy Bingo is a friendly looking site from the experienced team at 888 Holdings (think Wink Bingo, Tasty Bingo and Red Bus Bingo to name just a few). 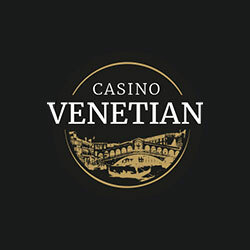 This is a Dragonfish networked site and on opening does not benefit from any exclusive features, but does have a generous slots and bingo bonus welcome offer. 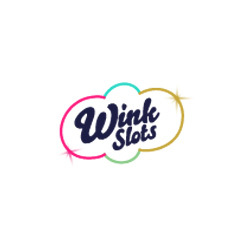 An excellent selection of bingo and slot games awaits, although at this point all the promotions will be very familiar to experienced bingo players. Anyone new to bingo will enjoy their first experience of the game at Snowy Bingo. 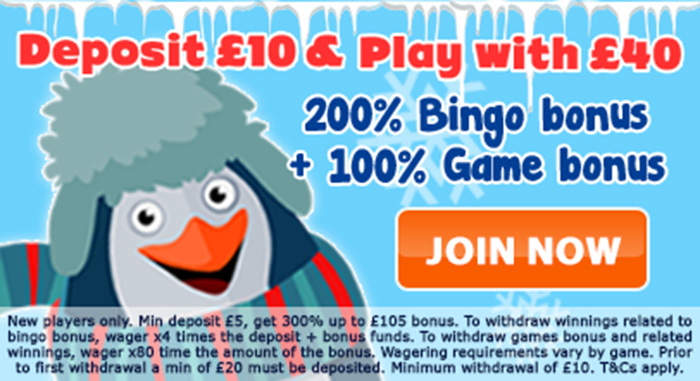 Snowy Bingo has bonuses, free bingo tickets, slot games and lots of exciting promotions. 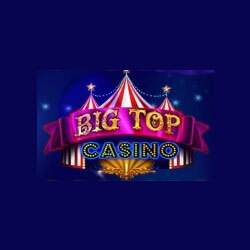 Minimum deposit is £5 and the maximum bonus available is £105. Popular rooms including Bounce’T and the Weekender can be found at Snowy Bingo. 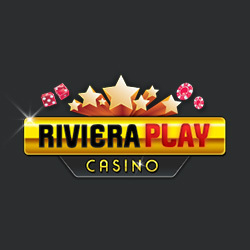 Late Night Show – Open only to 50 players each night and win up to £100 cash. Opens at 00.30 and plays at 00.45 – only 15 minutes to get in and get tickets. Full house pays £50, two lines is £30 and the line pays £20. Access Snowy Bingo via any mobile device on the relevant mobile browser. The games are fully optimised for mobile play and is very user friendly. It’s easy to find exactly what you want. Sun Bingo opened for the first time in 2006 and since then has gone from strength to strength – remaining popular enough to win two awards in the WhichBingo Awards 2014 – Best TV Advert and Best Chat Team, having previously scooped the Site of the Year award. After that there is the first deposit bonus to take advantage of. That’s a £20 bingo bonus and a £10 games bonus. The bonus will remain in the account for 7 days before being retrieved if not used. 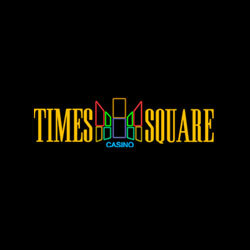 Haunted Hallows, Frooty Licious, Irish Luck, Game Set Cash and Jewel Mine were added to the slot list in October 2016. An special slot game available is The Sun Winning Headlines. The winning reels relate to items found in The Sun newspaper as well as the normal slot game symbols. These include Dream Team, Bizarre, TV Biz and Hols from £9.50 – all instantly familiar features to Sun readers. Sun Bingo offers players on the move a number of options. This can be accessed on the mobile browsers of both iOS and Android mobile phones, on an iPad, but not currently on Android tablets – this capability is to follow soon. 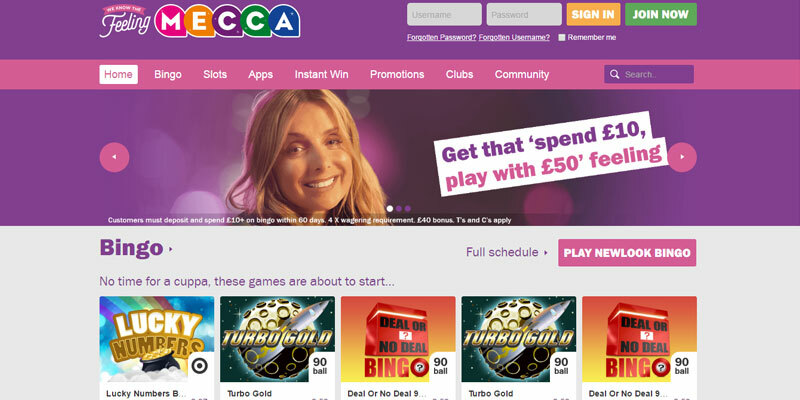 Mecca Bingo Online since 2009 and powered by Virtue Fusion by Playtech software, this bingo site offers 30, 75, 80 and 90 ball bingo games, slots, casino games and mobile games. Clucky Bingo launched in June 2013 as the latest bingo site on the fast expanding Jumpman Gaming platform. On the 15 network, Clucky Bingo has all the features we have come to expect from this bingo platform. When you arrive at the bingo site, you’re met with a striking design. It features what looks like birds on top of a wooden bird house with a sign expressing ‘Foxes keep out’. The centre of the screen is dedicated to that spin the wheel feature. You can have a practice spin on it, but remember you wont get anything until you make your first deposit. The minimum deposit at Clucky Bingo is just £5 which I think is good, because not everyone can afford to deposit £10 at a time. You will only get a spin of the bonus wheel when you deposit at least £10 though. There is also a special Newbies Free Bingo room available each evening during the first 7 days from deposit. 50% reload bonus on every re-deposit. This also gives access to the Daily Depositor freebie room. This has a £20 jackpot every hour from 11am to 11pm. Clucky Bingo has a mobile bingo site that you can play at, with no downloading required. Pop the web address into the browser on your device and you can then register or log in to play all the games it has to offer. Enjoy all the top games and promotions you know and love at the site where it is Christmas all year round. Jingle Bingo is a Dragonfish bingo site and you will find all the familiar bingo games and all the top slot games, including Fluffy Favourites and Sugar Train, plus many more. At Jingle Bingo there is a deposit £10, play with £40 offer. That is a 150% bingo bonus and a 150% games bonus*. 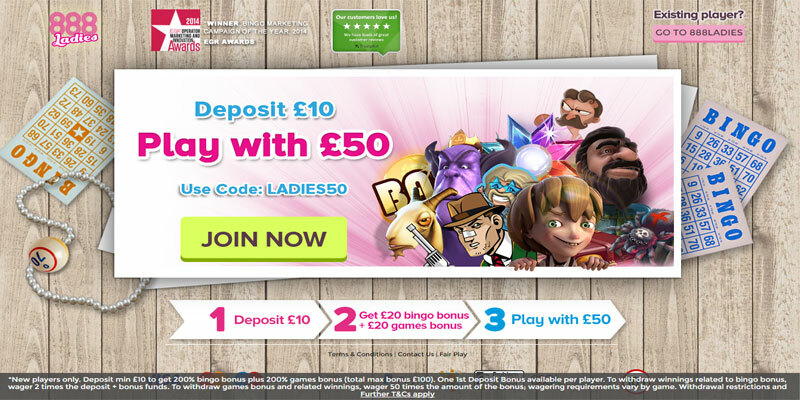 Up to £52.50 in bonus on each is possible, with the minimum deposit amount set at £5. Access Jingle Bingo via any mobile device on the relevant mobile browser. The games are fully optimised for mobile play and in many cases appears to have a more modern format than the desktop version of the site. Monday Madness is a game that switches the prizes. So, those who are quick of the mark to win the line, walk away with the full house prize, then those who win the house only get the line prize. Head to the Lucky Stars 90 ball bingo room, every Monday evening between 4pm and 7pm to play this bonkers bingo game. Pay Day occurs on the last day of the month at 8pm. Prize is £1,000 and tickets cost 50p. Deposit with Maestro Card, MasterCard, Solo, Switch, Visa, Visa Debit and Visa Electron.